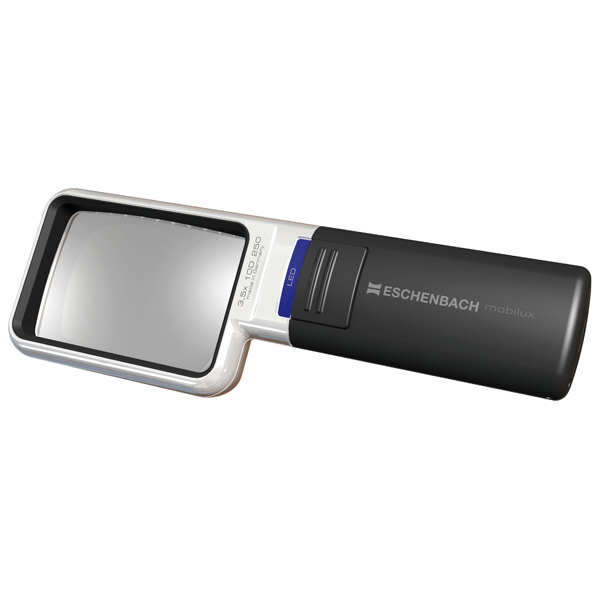 The Eschenbach Mobilux LED Illuminated rectangle Pocket Magnifier is designed to be a battery operated portable Magnifying Glass and is powered by 2 standard AA size batteries. The Mobilux range of Illuminated Hand Magnifiers has been updated and improved. This item code of 15113 replaces the previous item code 151034. The LED bulb of the Lighted Magnifier has an unlimited life so no bulb changes are required together with a 10x longer battery life. The Hand held illuminated magnifier has a large easy-to-use switch and removable lens case provides optimum protection for the lens and a strap to attach to a belt.